Did you know that it is International Map Year? 2015-2016. The International Map Year (IMY) is a worldwide celebration of maps and their unique role in our world. Supported by the United Nations, IMY provides opportunities to demonstrate, follow, and get involved in the art, science and technology of making and using maps and geographic information. Think about ways in which maps can be integrated into your work! Great retrospective on 100 years of National Geographic map making. Since 1915, National Geographic cartographers have charted earth, seas, and skies in maps capable of evoking dreams. This beaut on the right is from 1968 of the ocean floor. The article says: " Based on the work of geophysicists Bruce Heezen and Marie Tharp, this 1968 map of the ocean floor helped bring the concept of plate tectonics to a wide audience. Tharp began plotting the depths in 1950 from soundings taken by ships in the Atlantic, but, as a woman, wasn't allowed on the ships herself. In 1978 she was awarded the Society's Hubbard Medal for her pioneering research." 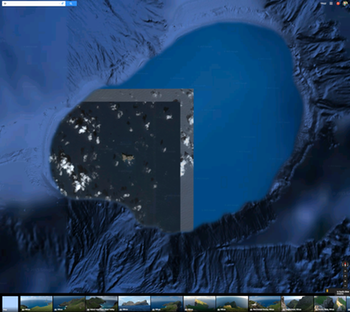 Planet Mapping: The Science of 3D Maps. Find out what tools and techniques are enabling today’s modern cartographers to render 3D maps. Our world is constantly being captured through GPS, cameras, satellites, and scanners and rendered by algorithms into navigable maps of Planet Earth. But how are 3D maps really made? How is the data collected? Hear from some of the hottest startups in the field about the science and technology behind 3D map making—from data collection, to processing, to display—and discover how you can make your own 3D maps. During the event, enjoy the visual stimulation of the PLACEMAKERS exhibit on view at swissnex San Francisco. Technical Tidbits From Spatial Analysis & Data Science. This nice blog highlights many technical aspects of web mapping: Leaflet, D3, R... lots of neat examples. From Martin Isenburg, the brain behind LAStools. 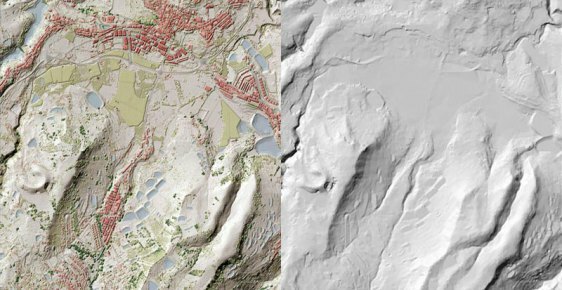 Using LAStools, ArcGIS, and Photoshop, GRAFCAN has produced a LiDAR-derived digital suface model (DSM) that is seriously doped up: a synthetic map providing an intuitive understanding of the landscape. The product combines standard hillshading with a height and feature based color-coding that enables the viewer to "see" where trees are tall and to grasp height differences between buildings. The new product is available at a resolution of 2.5 meters/pixel via the GRAFCAN Web viewer and also as a WMS service. More info and pics here: http://rapidlasso.com/2013/11/03/grafcan-launches-dsm-on-steroids/. Comparison between bare earth DTM and DSM with cartography. Check out the greenhouses, which ppear as “low planar vegetatation”. They are made out of coarse maze fabric (instead of glass) that lets the laser through and does not deflect it (like glass would). Funny video on maps - gotta check it out! Check out this hilarious video on the paper map: the new bio-optical knowledge recording and dissemination system. "...impossible to hack, without any antivirus and firewall..."
Food: An Atlas by Guerrilla Cartographers is ready for your support! An atlas of food: a cooperatively-created, crowd-sourced and crowd-funded project of guerrilla cartography and publishing. Check it out! 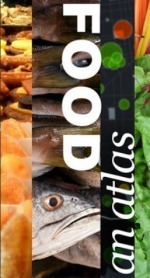 Food: An Atlas is ready to roll. Check out the promo at kickstarter and consider supporting the project. Interesting Topic. 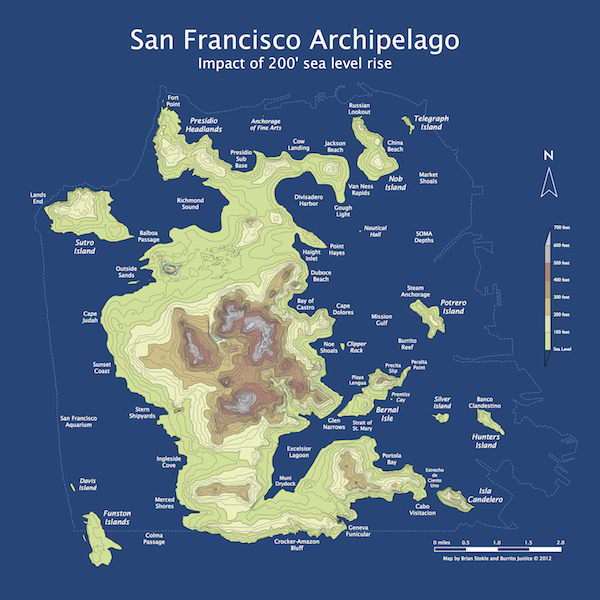 The subjects of these maps inherently represent risk, which we want to understand. Unexpected Scope. A forest view of something that’s usually seen at the tree-level offers satisfying perspective. Big and Clear. A single dataset is conceptually simple, and when large enough, it provides its own context-promoting conversation in the wild. Sharable. A static image is portable and paste-able, easily nestling into articles, blogs, tweets, and PowerPoints. Attractive. The currency of design buys a second or third look. There is often a push to make large datasets available through interactive webGIS portals, but I think this makes a good case that there is still also a role for skilled cartography to present information in captivating ways. Below is an example of one of the author's (John Nelson) maps, and more can be found here. NY skyline from Tim DeChant's blogAAG was a moderately large conference (just under 9,000) this year, held in mid-town NY. It was a brief trip for me, but I did go to some great talks across RS, GIScience, cartography, and VGI. I also went to a very productive OpenGeoSuite workshop hosted by OpenGeo. Some brief highights from the conference: Muki Hacklay discussed participation inequities in VGI: when you mine geoweb data, you are mining outliers, not society; there are biases in gender, education, age and enthusiasm. Agent-based modeling is still hot, and still improving. I saw some great talks in ABM for understanding land use change. Peter Deadman showed how new markets in a hot crop (like Acai) can transform a region quite quickly. Landsat 8 will likely be launched in early 2013, but further missions are less certain. My talk was in a historical ecology session, and Qinghua Guo and I highlighted some of the new modeled results of historic oak diversity in California using VTM data and Maxent. Saturday evening I had the great pleasure of being locked in after hours at the NY Public Library for a session on historic maps. David Rumsey, with Humphrey Southall (University of Portsmouth) and Petr Pridal (Moravian Library) led a presentation introducing a new website: oldmapsonline.org. The website's goal is to provide a clearer way to find old maps, and provide them with a stable digital reference. David Rumsey, with Humphrey Southall (University of Portsmouth) and Petr Pridal (Moravian Library) led a presentation at AAG introducing a new website: oldmapsonline.org. The website's goal is to provide a clearer way to find old maps, and provide them with a stable digital reference. As David says: hundreds of thousands of historical maps have now been scanned and made available on-line by libraries around the world, and this has been a great boon to anyone interested in the history of cartography. However, those interested in the history of the places shown on maps have been less well served: just because a map is "on the web" does not mean we can find the relevant library web site, and even when we find the site the available catalogues are little help in finding maps covering particular places. A further problem is that even when digitized historical maps have been made available via geo-spatially aware online systems, the resulting references,i.e. the Uniform Resource Locators for accessing the maps, are generally very technology-dependent and unlikely to work even a few years later. The Old Maps Online project provides a universal search portal for historic maps designed to complement rather than compete with libraries' own search interfaces, and also developing best practices for defining persistent Uniform Resource Identifiers for historic maps - URIs not URLs.